Cardiff serves simultaneously as a city and a county of Wales. Cardiff is the capital of Wales and the largest city in the country. The town is the prime commercial capital and graced continuously by scores of interested tourists. Set within the historic county of Glamorgan the origins of the county name is debated on but the most widely accepted belief is that the name stems from the English version of the Welsh title Caer-Taff which means Fort on the Taff. .
During the1st century, the Romans constructed a minor fort. The towns continued to expand with the arrival of the Normans during the 11th century. The lords of Glamorgan chose Cardiff Castle as their base, and the city served both as a small port and a market centre. .
Today the ancient city of Cardiff contains a plethora of activities that entertain both locals and visitors alike. The county is home to many informative museums, sites, parks, restaurants, bars and contains a thriving music scene. The number of attractions can be a little daunting however we feel Cardiff Castle, Cardiff Bay and Cardiff Central Market are worth a visit. Drop into the Wales Millennium Centre, or Spillers Records are bustling locations to enjoy great music. . I am zefario, hire me today! 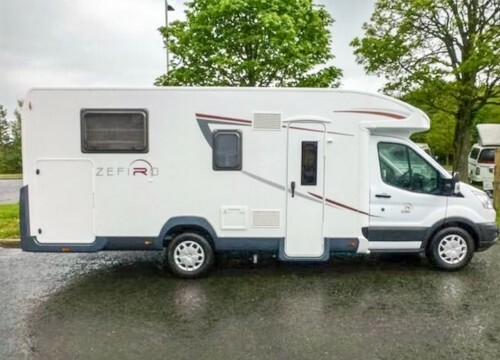 2016 ROLLER TEAM ZEFIRO 696 The all new Zefiro 696 offers a comfortable island bed to the rear, mid ship en-suite area with separate shower cubicle, L-shaped kitchen area which also backs up to an L-shaped dinette with 2 inertia reel seat belts allowing 5 people to travel in safety. What the 696 offers differently is an electric drop down bed behind the cab area, above the lounge.